Ages 10 through 17. Help students with pragmatic communication deficits learn strategies for effective social interaction using the audio cassettes and activities in this kit. Skills emphasized include expressing feelings and viewpoints, reacting to criticism, making decisions, communicating in a socially appropriate manner, and being assertive, direct, and honest. 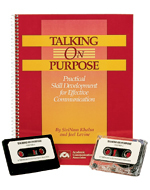 The audio cassettes that accompany the manual include dialogues that demonstrate both effective and ineffective communication styles. The kit includes the activity manual and two audio cassettes that provide "real life" interactions in a variety of contexts. Discount codes and coupon discounts cannot be used with this item because it is already significantly discounted (Short term special).